Hey, a sailing boat is not a balance beam! You shouldn't do crazy tricks on it like that! Apparently Sail Simulator 5 let's you do it if you are lucky enough, and if you're hitting the high seas with 20 miles per hour. 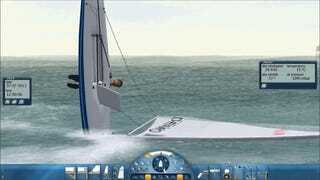 No doubt it's a logical way to make virtual sailing exciting. Just as exciting as virtual woodcutting or handling virtual cranes.